Determine the appropriate land uses and densities at sites near each station. Provide recommendations to improve multimodal access to each station (using information gathered during the Master Plan of Highways and Transitways and the Bicycle Master Plan to help inform the access portion of this plan). Consider other concerns raised during the planning process (i.e. parking). Boyds and Germantown MARC Station Areas with 5- and 10-minute walk radii. December 20, 2018: The Planning Board approved the Planning Board Draft plan and transmitted it to County Council. View the Planning Board Draft and the Draft Appendices. June 21, 2018: Planning Board work session #4: Germantown Connect Section Recommendations. View the staff report. May 31, 2018: MCDOT Middlebrook Road PRSA briefing. May 31, 2018: Planning Board work session #3: MTA/MCDOT Briefing. View the MTA presentation and the staff report. May 24, 2018: Planning Board work session #2: Boyds. View the presentation and staff report. April 5, 2018: Planning Board work session #1: Planning Context. View the presentation and staff report. February 1, 2018: Watch video of meeting; listen to audio recording of the meeting held at Black Rock Center for the Arts on Thursday, February 1 at 7 p.m.
December 21, 2017: The team presented the working draft of the MARC Rail Communities Sector Plan to the Planning Board. View the presentation, the staff report and Working Draft. For past news and events, see the MARC Rail Communities Planning Library. The MARC Brunswick line is a well-traveled commuter rail line connecting West Virginia to Washington, DC. The first four stations in Montgomery County are Dickerson, Barnesville, Boyds and Germantown. 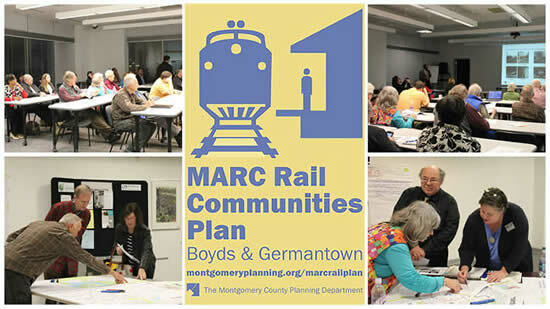 The Boyds and Germantown MARC Rail Stations are the focus of this Master Plan. Due in part to increases in population in the surrounding area, specifically in Clarksburg, Boyds has experienced greater transportation pressures in and around the intersection of Barnesville, Clarksburg and Clopper Roads. Additionally, the Montgomery County Parks Department is considering development of a local park immediately to the southeast of this intersection along Hoyles Mill Road. The Boyds MARC station contains 15 parking spaces that are quickly filled. It is assumed that many commuters will typically drive to the next nearest MARC station to find a parking space. Finally, the comprehensive revision of the County’s Zoning Ordinance, enacted on October 30, 2014, allows the reevaluation of non-residential zones around the MARC stations and densities more compatible with rural and historic character. In Germantown, a significant amount of new residential development has been proposed or approved, and constructed within one-half mile of the MARC station since the approval of the 2009 Sector Plan. Additionally, there are significant numbers of developments proposed in the Germantown area along the route of the future Corridor Cities Transitway (CCT) that will have an impact on the MARC station area. The Germantown MARC station has approximately 694 parking spaces, but typically these spaces fill up very early in the morning. It is anticipated that more commuters may use the MARC station if access conditions are improved. Additional resources and maps are posted on the MARC Rail Communities Planning Library. Subscribe to the email list to keep up with the latest updates. Meet with us in our offices in Silver Spring or at your own group’s meeting. Come to public meetings, workshops and outreach events. 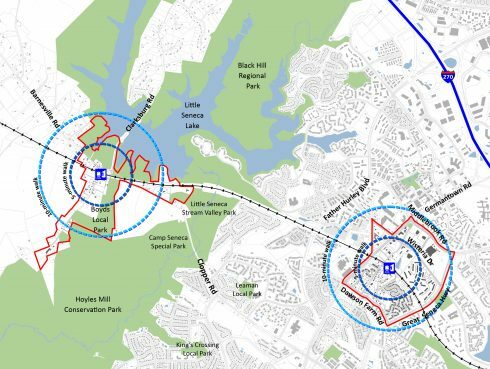 Visit the MARC Rail Communities Planning Library page for documents, drawings, and recordings from the MARC Rail Communities Design Workshop and other meetings.